Jason Isaacs is one of the North East’s most well known and well loved wedding performers, delighting audiences across the UK and beyond. If you’re looking for effortless charm and a huge voice that’s been compared to Sinatra himself, then you’re looking for Jason Isaacs. 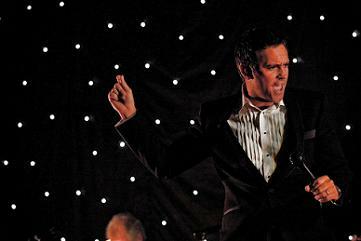 Jason is known for his stunning vocals, his exuberant showmanship and his unshakeable love of Big Band Swing. Jason delights in guiding his audience through this most exciting and enduring era of music. His smooth voice and charismatic swagger create the perfect package to entertain any audience in any venue. Your very special day At weddings, Jason’s professionalism, care and attention to detail, guarantees that your first dance will be remembered forever. He treats every wedding as unique, combining a personalised approach with his tried and tested set list. This, together with Jason’s stunning voice and charming personality, will guarantee to have people smiling and dancing all night long. One song and you’ll be agreeing with the stars: “That was, quite simply, superb!” Pete Waterman.